A heavy duty hydraulic scissor lift with exceptional reach. The extremely stable platform rides on a triple set of direct pinned scissor legs with shared hydraulic cylinders for smooth travel up to 48 inches with a load capacity of 4000 lbs. lbs. Requiring very little maintenance, this lift offers a high life cycle under rigorous conditions. Lowered heights from 16-1/2" to 25-3/4"
Capacities from 2,000 to 6,000 lbs. Vertical travel from 48" to 144"
This hydraulic lift comes standard with two piece self-aligning cylinder, one-piece acle pins, and high impact spiral wound bearings for stable durability, and low maintenance operation. High impact, spiral wound bearings at every pivot point provide maintenance-free, rugged resistance to abrasion, impact, and uneven loads. Structural cross-members at every pinned joint in the scissors assembly minimizes leg deflection due to twisting or spreading under high/uneven loading. All hydraulic cylinders contain two-piece, self-aligning piston rods that transmit minimal side forces to the cylinder hinges/pins, significantly reducing wear. 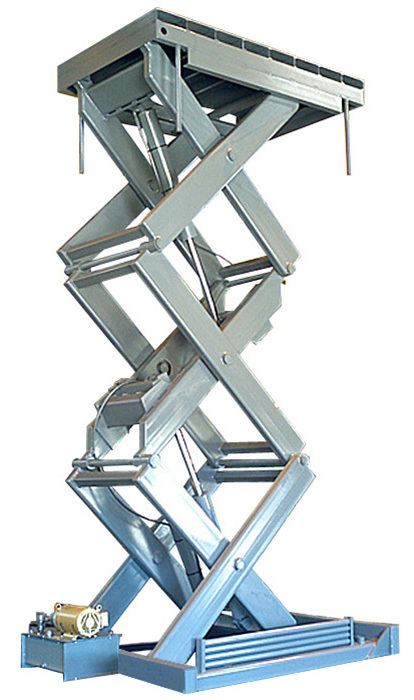 Structural steel channels in all top and lower frames provide additional rigidity and resistance to twisting/bending of the lift under load. Solid steel legs and added stiffeners provide overall stability and straight, repeatable roller tracking as the lift raises and lowers. Joints, the most critical wear points in the lift, feature chrome-plated, 100,000 psi, ultimate-strength pins for premium load strength and long life. Minimum 1/4-inch-thick steel-reinforced platform minimizes deck deflection, maximizes load stability, and greatly extends the life of the platform deck. Autoquip offers an industry-best 2 year warranty on all parts as a promise that you've purchased the industry's most reliable scissor lift. One-piece, removable center axle pin adds rigidity to the scissors mechanism and allows easy inspection and maintenance of the axle pin - a task that is virtually impossible on competing brands. On-board maintenance devices enable maintenance crews to safely and effectively block open the scissors during inspection and routine maintenance. Sturdy, semi-transparent polyurethane oil reservoir provides an easily visible method of checking fluid levels and eliminates oil contamination due to rust. Low pressure hydraulic circuit extends th+AE156e life of all hydraulic components and puts less stress on the electric motor. Double wire braided Parker hydraulic hoses resist wear, abrasion, and leaks. Standard controls are prewired and internal power unit is onboard. Installation simply includes lagging the unit to the ground and connecting to electricity. Hydraulic velocity fuses completely stop lifts in the unlikely event of uncontrolled descent due to sudden hose rupture. Minimum 3:1 structural factor of safety makes these lifts the most structurally sound lift in the industry.